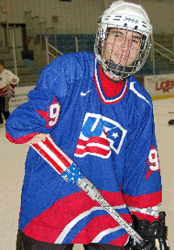 Standing/Amputee is played upright and follows typical ice hockey rules. Standing/Amputee Hockey has allowed a growing number of athletes with congenital or acquired amputations or other physical impairments to enjoy the great sport of hockey. Players use prostheses to control a hockey stick or to skate, and these skills can be improved as with any other hockey skill. There are many opportunities for Standing/Amputee Hockey players in local areas for recreation/competition all the way to international competition. Combining players with various types of disabilities creates a unique team experience in this fast-paced exciting sport. In an effort to promote standing/amputee hockey, USA Hockey works together with the American Amputee Hockey Association. Founded in June of 2000, the American Amputee Hockey Association (AAHA) operates under the USA Hockey umbrella and the goal is to bring together individuals involved in standing/amputee hockey to promote the sport. Click on the Amputee Hockey Logo for the latest on the National Standing/Amputee Hockey Team.